Posted in appetizers, French, recipe, savory by Antonio Tahhan on December 15th, 2008. You can follow any responses to this entry through the RSS 2.0 feed. You can leave a response, or trackback from your own site. wow, I cant even imagine the look on my husband’s face if I make this for him. I will light up! Oh Tony, this is wonderful! Brie is one of my very favorite cheeses! What a great use for Brie. Good to see you’re enjoying the cheese at wholefoods! Brie is awesome. I’ve never had it baked, though, but it sounds amazing! That’s a good one, Mr. Man. I’ve stuffed brie with nuts, fruits, pesto, even chorizo but it never dawned on to me try a garlic paste. Interesting. Ah, you are true cheese head entrepreneur, my good man. Way to sell those wheels with a fantastic recipe 🙂 I can hear people lining up from here. Ever see Anchorman? “Baxter, you pooped in the refrigerator AND ate a whole wheel of cheese? I’m not even mad, I’m impressed” Haha. Wow, I’ve already bought all the app ingredients for my party on Wednesday, but I think I’m going to add this to the menu – it sounds delicious! Congrats on your new job – I can’t think of anything more fun! We’re having a party food recipe contest and would love to have you enter this or another favorite recipe. I’ve linked to the contest through my name – deadline to enter is tomorrow at 4 PM. Congrats on the new gig and the part-time work at Whole Foods. Sadly, upscale markets like these also attract people with lots of money and no taste…blue cheese rocks but your baked brie RULES! Thanks Shelby!! It’s one of my favorite cheeses, too! I am loving my new job, haha. Thanks Peter!! Pesto and nuts sounds delish!! I’m going to have to give some of these combos a try 🙂 Thanks Joan! Oh, no!! Núria… pero es TAN delicioso! I LOVE that line, haha! Thanks Emily! I hope it turns out well! I will check out the contest, too. Thanks Peter! The job is pretty sweet. The cheeses I get to taste are out of this world, too! wow Tony, this looks incredibly good! I bet it makes a nice soothing dish; perfect for a cold night! Thanks for including us — your brie recipe still rocks with our friends. Love your photos, too. Maybe Whole Foods would let us do another video there! 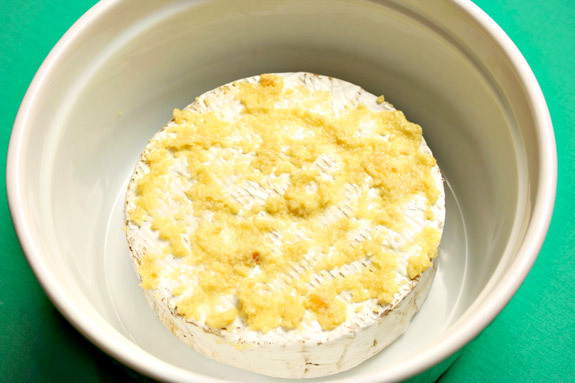 Now that’s some delicious looking Brie Mr Man…great great recipe. I love the wheel smothered in garlic. Made my heart leap with joy! have a good holiday season, & a wonderful 2009! My hubby and I used to go hang out in the cheese section of Whole Foods. Sadly, we don’t have any real WFM love here in Tucson (we have one, but it’s a pretty sad excuse for a WFM). Sounds like such a fun job! I can’t imagine the heaven that is being surrounded by cheese all day! Score on the sweet job! 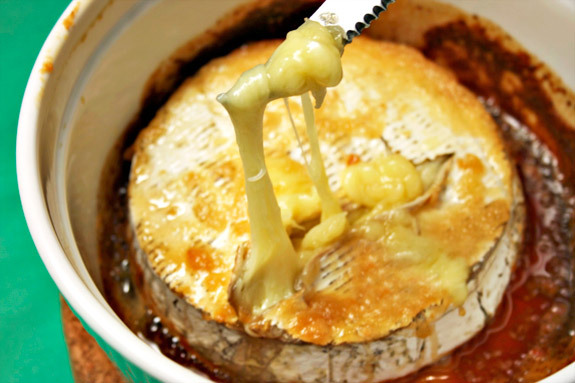 This brie looks unreal, looking at the gooey cheese in the picture with the knife makes me want to reach out, grab some, and lick it off my fingers. I serve goat cheese like this kind of. 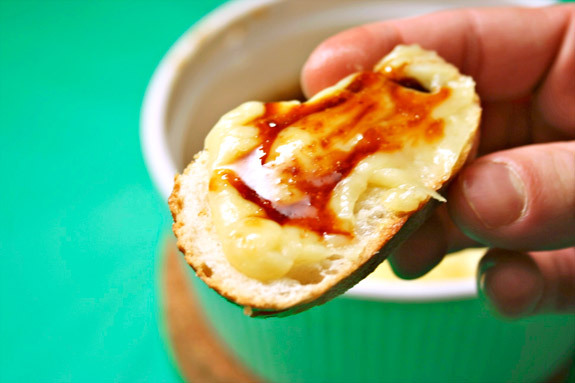 I toast the baguette slices and rub them with whole cloves of garlic (a chick in Spain showed me that as a great way to turn your bread into garlic bread), then I spread warm goat cheese on the bread and drizzle with honey. Honey is so great with strong cheeses. 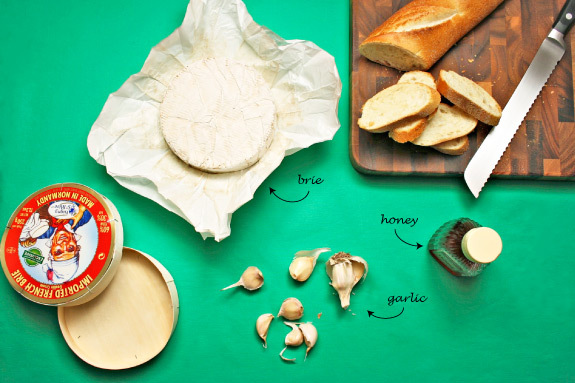 I might steal this idea for a post I am working on with 10 ways to dress up your brie. It will be a while in coming though since I need to find 10 occasions to make and eat brie (hopefully none of which are just me eating the whole wheel myself). 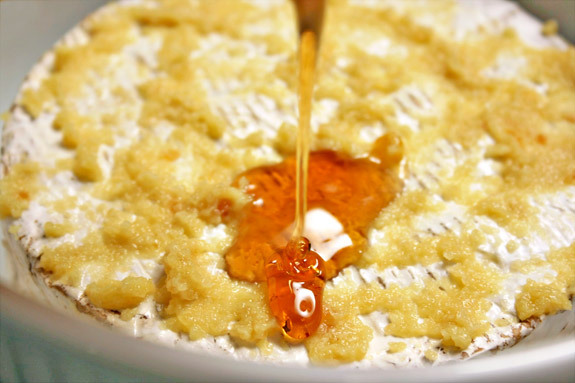 I just surfed in here on the link to your brie and garlic and honey recipie…I’m sorry I don’t know who you are but after reading this recipie, I think you and I could be verrrrrrrrrry good friends….especially if you serve stuff like this to your friends..YUM!!! I used to work in Whole Foods, in the seafood dept right next to Specialty. I got to work with some amazing people and learned a lot about cheese in the process. Just want to say thank you to you, people like you make that possible. I saw this on Foodgawker and had to come directly to check the recipe out! I had tried baked brie with honey and almonds before but can’t wait to try it with garlic! Looks great! Yes! I have been wanting to make this since you commented about it on my blog. I wasn’t sure on the details though, so I never got around to it. Now I AM MAKING IT. Done. Said. IN CAPS. Oooh, what ooey gooey goodness! omg. That oozy brie is screaming goodness! Looks like am amazing appy for any party! Made it tonight for dinner. Amazing (couldn’t stop eating it). That is a thing of beauty! So simple and yet powerfully flavored. I know it’s been forever–well, in Internet time–since you posted this, but I wanted to let you know, Tony, I made your garlic-honey brie for a party last weekend and it was a huge hit. Everyone thought it was utterly delicious. I know I’ll be using this recipe over and over and over again. nom nom. i love brie, i love honey. what a great combo recipe. I’ve been wanting to try baked brie for ages. I found your recipe on foodgawker today and made it. It was so good. I love the combination of the garlic and honey! My whole family enjoyed it. I think brie is my new favorite cheese. Hi, Antonio! Do you remember me? The techie that went to the Apple Store to look at the iPhone 5 on 9/22/12 about 12 years old? Then ate your amazing Grilled Cheese Brie? You need to post that recipe you made for me at Whole Foods! I loved it soo much!! For lunch my mouth was watering just thinking about how amazing your food is!